Compare core dimensions and air flow requirements and choose the core that best meets the needs of your application. For each core thickness (A Dimension), you will find a variety of core dimensions: core length (C Dimension), and core height (B Dimension). 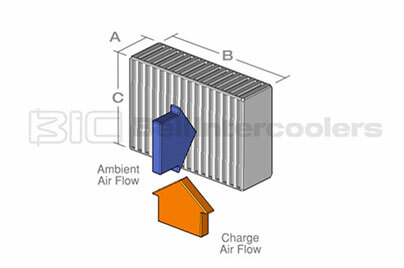 Refer to the intercooler core diagram on the right of this page to be sure of the proper flow and dimensions in relation to your application. 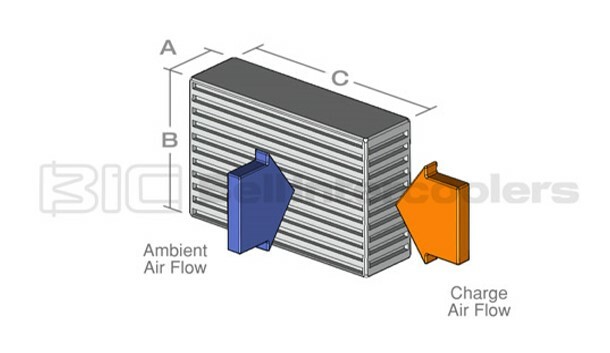 Each core configuration selected is listed for air flow, shown in cubic feet per minute (CFM, based on 1 psig pressure loss across the intercooler core and a charge-air pressure of 10 psig).